Beautiful! The orange is perfect! Safavieh Mahal Traditional Grandeur Navy/ Red Rug - 5'1" x 7'7"
Nourison Madera Light Orange Area Rug - 3'6" x 5'6"
Enhance your modern decor with this vintage-inspired light orange area rug. Made from polyester for softness and durability, this low-pile rug protects your floors and feels plush underfoot. Dimensions 60in. x 84in. x .50in. NOTHING like the photo and it's plastic.. literally a plastic rug, and cannot tress how unlike the photo it is , disappointment. 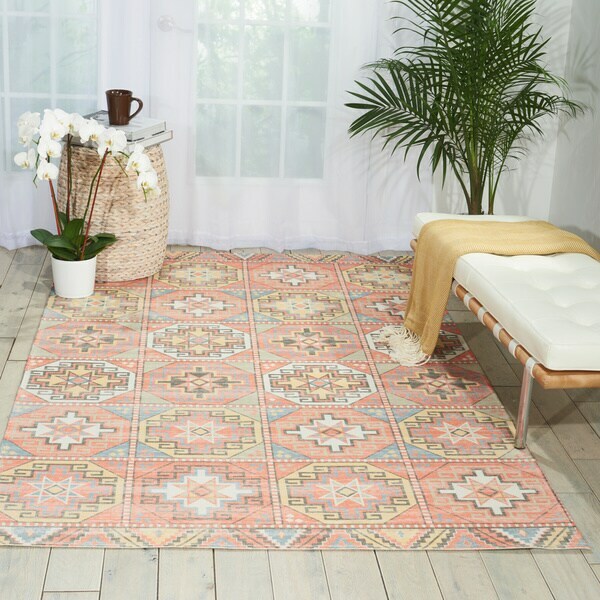 Trocadero Boho Modern Geometric Pastel-Pink/ Blue Area Rug - 5'3" x 7'3"
Padua Yellow & Gray Distressed Mosaic Area Rug - 3'11" x 5'7"